Jack Payne (left) celebrates scoring a goal for Posh at Sheffield United last season. Photo: Joe Dent/theposh.com. Peterborough United midfielder Jack Payne has today (September 1) joined League Two side Leyton Orient on loan until the end of the season. 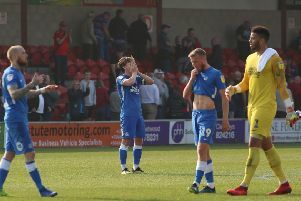 Payne, last season’s Posh skipper, spent part of the summer playing for Orient, but a potential move stalled over the size of a transfer fee. Orient are understood to have offered £50k for a player Posh bought from Gillingham for £700k two-and-a-half years aso. Posh have been keen to get the 22 year-old off the payroll. The move is expected to become permanent at the end of the season. Payne is under contract at the ABAX Stadium until 2017 so Posh would still expect a transfer fee. Payne has made 104 appearances for Posh and scored six goals. He started one game this season, the 2-1 defeat at Burton Albion on August 22. Earlier this summer Payne expressed a wish to move nearer to his Kent roots.